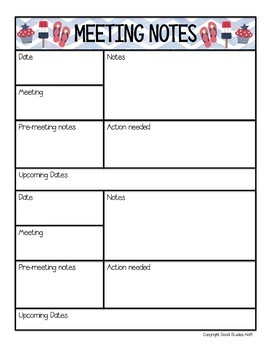 These meeting notes templates for teachers and administrators will help you stay organized, focused, and productive at the meetings you attend. Just print and go! There are 16 colorful designs included as well as one backline template. 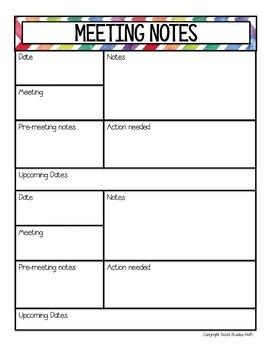 These templates can be adapted to any meeting you attend - grade-level, professional development, department, etc. 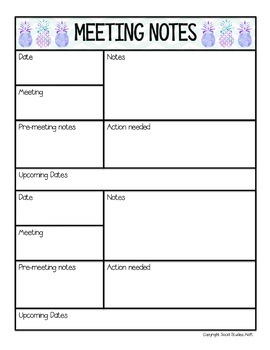 Please note, these templates come in a pdf file and are not editable. You may also like my Podcast Notes & Takeaways Log. 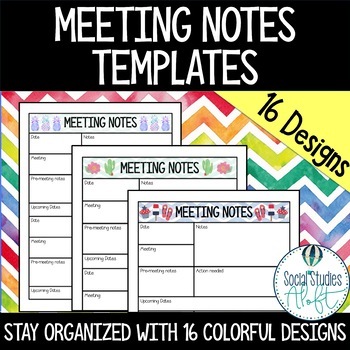 Follow @SocialStudiesAloft on Instagram and Pinterest as well as the Social Studies Aloft store on Teachers Pay Teachers for updates on new products and sales. Copyright © 2019 Social Studies Aloft. All rights reserved by author. This product is to be used by the original downloader only. Copying for more than one teacher, classroom, department, school, or school system is prohibited. This product may not be distributed or displayed digitally for public view. Failure to comply is a copyright infringement and a violation of the Digital Millennium Copyright Act (DMCA). Please leave feedback from this product. I would greatly appreciate it, and you will earn TpTcredits to apply to future purchases.